World’s Most Hard-working Nations – India 7th! India is furiously pursuing development through science and technology. But, none of these automated efforts would work without the hard-work that its citizens put in every core sector of the industries they work in. The sincerity and hard-work put in by Indians has enhanced the nation’s visibility on the global map as being the 11th largest world economy, and is already wealthier than Australia and Spain. Moreover, this nation of hard-working geeks produces over 6 lakh engineering graduates annually. While the West may think of India as still being a developing economy, a latest survey by Ipsos Global and Reuters has ranked India as 7th most hard-working nation of the world, in terms of its full-time workers using their allotted paid holidays. The survey provides that more than half the number of Indian employees do not use their vacation holidays which usually count up to 28-30 days of govt holidays plus paid holidays annually, apart from regular weekend leaves. Usually, China is looked up to as the Michael Jordan of emerging economies. And, every rising nation wants to emulate China, in terms of its professionalism and sheer growth it has logged over the past decade, as a role model to move higher up the ladder. In fact, even Indians are considered less professional than their Chinese counterparts when it comes to businesses other than outsourcing and selected few fields. But, in this case, Indians employees have scored over their Chinese counterparts when it comes to using up their paid quota of holidays. As against 65% of the Chinese employees taking up all their vacation days, only 58.5% of Indian workers avail of such optional holidays. This also counts pretty well when compared with American workers, 57% of whom take all their vacation days. Moreover, India stands better-off against other global nations such as France, Mexico, Russia, Italy, Poland and Sweden when it comes to the likelihood of workers from respective countries claiming holidays from their quota of paid holidays provided by their employers. 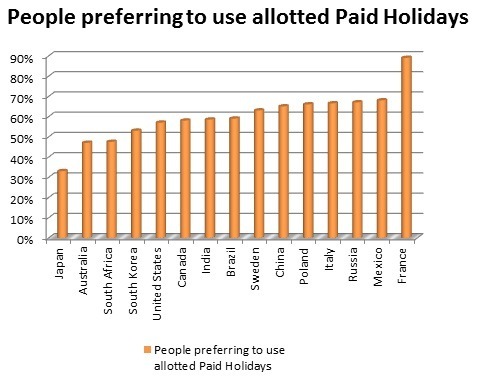 While France emerges as the biggest laggard with 89% of worker citizens availing of their allotted vacation days, Japanese stood afloat at numero uno position with only 1/3rd of working population claiming their full quota of 16 public holidays in Japan. Over here, my question to our readers is how much do you credit the findings of such survey to seek estimates about work efforts put in by a country’s citizen, which is merely based on determining the likelihood of employees using all their vacation days. Is Business Ethics an Oxymoron? Urban Teens bags Pocket Money of over Rs.12000/month! Totally agree with Manoj. Even GDP, GNP, Per capita income and other figures just don’t cut it. There have to better ways to measure ‘hard-working’. In fact, even the word is debatable. Should I be working hard (like a donkey) or working smart? The answer is probably obvious. Exactly, that’s what I meant in my closing para, where I’ve hinted the readers that this survey should be taken with a pinch of salt being dependent on the sole factor of paid holidays and not the terms which should actually be used for the hard-work that people put in their work – be it physical or intellectual. Interesting statistics Viral! I agree with Aparajita’s point of view too! Thanks Varun for your valuable comment. “the west”. A development and sophistication indicating term. But, Swiss Banks and German Banks and many Island-nation banks have secret accounts, in which tainted,black and illegal monies are deposited. But they are illegal only from the depositors’ country point of view and not from the point of view of the so called ‘west’. If twin towers in US are attacked, that is terrorism. BUT, when India is attacked by US funded pakistani organisations, it is not. West is the most criminalised part of the universe. India should focus on Productivity…..The Industry (Corporates) / Middle Management find it easy to monitor # (physical) working hours/ # of days people take vacation. Vacations are designed for bursting stress & help people meet social & personal responsibility & unltimately improve an individuals productivity. Smarter ways of measuring productivity (task based) & methods to encourage intellectual imprvoement/realization of responsibilities may be more rewarding and sustainable for an economy/ corporate. As a nation, there is a good room left to improve Social/Civic & National responsibility. Absolutely Manoj, the above survey by the specified agencies have wrongly omitted the crucial productivity measure in determining the hard-work of the employees. 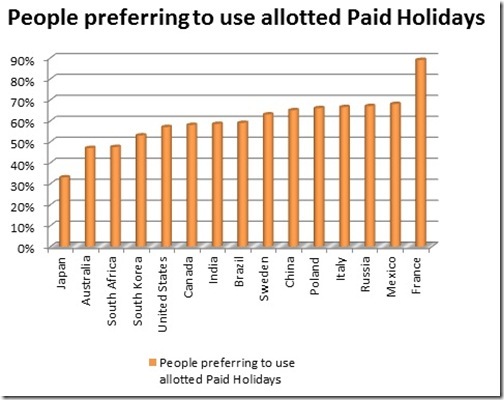 Optional paid-holidays are not of much use in India. Sometimes employers expect their staff to work on new years, diwali, holi or navrathri. Whatever be the occasion, India has never stressed on a 2-day weekend (very few companies actually grant it, and whats with the every second saturday being holiday in some?? ), but takes stress like we were designed for it. Nor is the nation very family-friendly. Not sure on what tangent my thoughts are skidding- but take for example, schools. Inundating children with homework they do not understand, projects they cannot fathom and assignments that leave no time for extra-curricular activities. Few schools expect both the parents to be educated, own XYZ vehicles, pay capitation fees etc. Indian employees are forced to work one way or the other to cope with life pressures. Agreed. The above survey findings might not be so worthwhile if one were to take into account the continuous work pressures which need to be fulfilled within a given boundary. Holidays, though optional, become a mandatory working day affair, if the targets remain unmet.